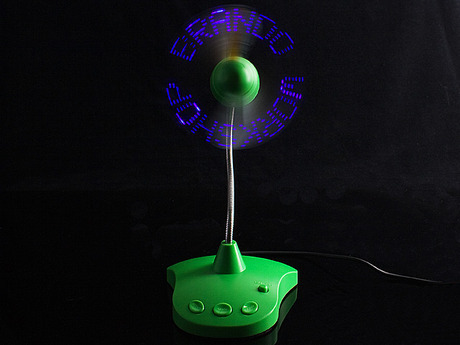 Why say it with flowers or a text message, when you could say it with a USB-powered LED message fan? Brando, the masters of USB gadgets, have made a fan that doubles up as a cute LED-lit messsage board allowing you to spell out any 16 character message: messages such as “sorry” or “I love you”. See above? there’s just one blade with four LEDs on it but it times switching them on to make it look like letters are being spelled out. We love it. Your friend will also receive a light cooling breeze as well as the message you want to send them. 6 messages (max. 16 characters in each message) can be stored and shown. The stored message will be cleared when the USB power supply is disconnected.